The Al Hosn or the Qasr-al Hosn is the oldest building in Abu Dhabi, and is also known as Abu Dhabi’s symbolic birthplace. 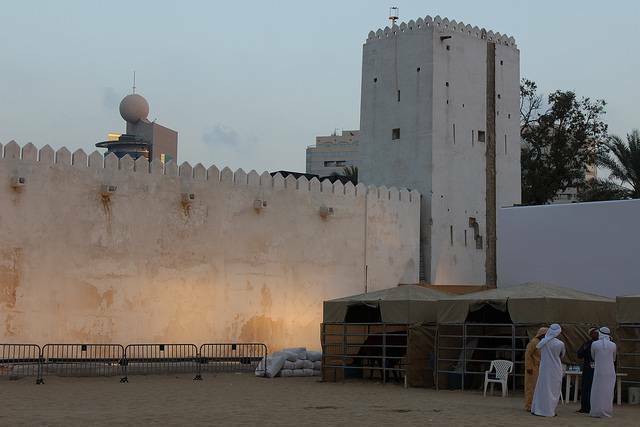 This was the first permanent structure built in the city and was home to the Emirate’s ruling family- Al Nahyan. This place has now been converted to a free-to-enter exhibition centre, which takes you through the history and the story of Abu Dhabi. The Al Hosn serves as the symbol of the heritage, culture and traditions of the Emirates which is very vividly depicted through the historic photographs and testimonies of the people. It offers some shows like the Bird Show or the local Music and Song performance, which takes you through the culture of Abu Dhabi in an entertaining way. This place was originally built as a watch tower, overlooking the sea, which was later transformed into a murky tower. It was built of coral and sea stone, which sparkled in the sun serving as navigation for the sea merchants. It was converted from the ruler’s residence to the museum on the orders of the late Sheikh Zayed Bin Sultan Al Nahyan. The Qasr- Al Hosn is a place to learn about the vibrant ethos of the Abu Dhabi and the Gulf.